hardwood floors in Ann Arbor, Michigan. Our local store offers a vast selection of high-end wood products and materials. We carry some of the industry’s most dependable brands, guaranteeing any hardwood option you choose will continue to impress far into the future. Not only does hardwood flooring like this elevate the appeal of a space, but it also improves the value of the house. If you are interested in taking advantage of results like this, then allow us to help you through the entire flooring replacement process. We are happy to provide valuable assistance every step of the way, from selection to installation. Perhaps one of the best things about hardwood flooring is the fact that it is designed to last for decades. Over time, any flooring will suffer from the damages of day-to-day wear and tear. The same truths apply to hardwood as well, but it has a great advantage that allows it to rejuvenate itself. When your hardwood floors get to the point that they are unsightly, you are able to sand them down and refinish the surface. This allows you to add decades to the life of your flooring. Like the phoenix rising from the ashes, your floors have the ability to look like new all over again. Most of our traditional hardwood is able to be refinished multiple times in its life as well, so you know your investment in this flooring is well worth the money. Turn to the knowledgeable associates at our location if you are interested in finding the engineered or solid hardwood flooring of your dreams. We are proud to carry some of the industry’s most popular flooring fashions. Engineered Hardwood Flooring – Engineered planks are an increasingly popular alternative to solid hardwood. Perfect for areas with increased humidity, such as basements and wet areas, engineered hardwood is made up of multiple layers of a plywood-like material. Topped with a layer of solid wood, the planks look and even feel like your favorite hardwood species. Solid Hardwood Flooring – Traditional hardwood planks are made from single pieces of solid wood. Available in a number of attractive species, there is a wide range of solid styles available to enhance the unique décor of your home. Whether you are interested in hardwood that is cozy and classic, or rustic and trendy, you can find the perfect product when you shop with us. Are Engineered Hardwood Floors Right for You? Every homeowner must ask themselves which kind of wood floors are right for their home. If you are debating about whether you want solid or engineered hardwood flooring, you should consider the lifestyle that you live. Generally speaking, engineered floors really shine in areas where there is a lot of moisture or heavier than usual foot traffic. Engineered wood flooring has a high level of durability and easily withstands the rigors of daily life. They can even be refinished like solid hardwood, just less often. Additionally, the installation process is very quick, and you don’t have to wait long before you start walking on your new floors. If you are still wondering if these affordable flooring options like carpeting, or luxury vinyl floors are right for you, talk to one of our sales associates and get the help you need to make the right choice. Deciding on the ideal surface is only the first step to getting the floors of your dreams. When you are ready for replacement, turn to us to make the process easy and enjoyable. Our commitment to your satisfaction doesn’t end when you make a purchase. We continue to deliver professional guidance and service thanks to our hardwood flooring installation service. The flooring experts that we employ include a team of technicians with decades of combined experience. These installers are prepared to perform even the largest of jobs swiftly and skillfully. Sooner than you ever thought possible, your family can begin enjoying new and improved hardwood floors. 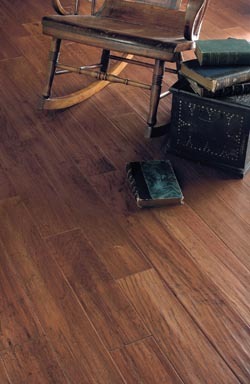 All eligible 4- or 5-star rated flooring products are backed by the Ultimate Confidence Guarantee. Should you, for any reason, be unhappy with your newly installed hardwood, all you have to do is reach out to us within 30 days of completion. We will then replace the unsatisfactory planks with a comparable product for free, so come take a look at our products today. Contact us today to learn more about our amazing hardwood flooring. We serve Ann Arbor, Ypsilanti, Plymouth, Brighton, and Jackson, Michigan.